Often in times of crisis we find unlikely heroes; individuals who go well beyond the call of duty. Often these people are gay. In ages past, this fact would be ignored, or not spoken about. It could even be a burden. Oliver Sipple was a Marine who saw combat duty in Vietnam. At home he was in the closet, but in San Francisco he had some chance to live his own life. He was standing outside the St. Francis Hotel in 1975 where President Gerald Ford was appearing. As Ford left the building, a woman standing next to Sipple raised a pistol at the president. She fired, but not before Sipple saw what was happening and lunged at her, deflecting her arm and causing her to miss. This act earned him the attention of the media — something he did not want. He didn’t want his name known. But the media was relentless. He asked them to not reveal he was gay, something he hid from his family, but, of course, the story got out — media feeding-frenzies rarely respect people and journalists feel themselves immune from consequences of their actions — after all, they sell a lot of papers and it’s not their lives that are screwed up. Sipple’s mother did learn her son was gay and she disowned him, precisely what he feared. While he later reconciled with his parents, his mental health deteriorated. He drank heavily, became morbidly obese, and was found dead at the age of 47. In Sydney, a mentally disturbed man, grabbing hold of religious extremism as his excuse, took customers of a coffee shop hostage. For hours, he threatened and used them as shields. Police negotiations were apparently going nowhere and the siege lingered past human endurance. This lone man had more than a dozen people in his grip but was getting sleepy. He started nodding off, even though he would try to fight it. The hostages were tired, but having a shotgun pointed at you has a way of keeping you alert. As the terrorist nodded off, the hostages ran for the door and safety — but not all of them. One man charged the terrorist. Tori Johnson was 34. He managed the Lindt Chocolate Café for two years. Employees and customers all said he was a good man, a kind man. He was also a gay man. Johnson tried to take the gun to protect the other hostages as they fled, but he was shot in the attempt. His attack distracted the terrorist. The others escaped and the sound of the gunshot brought in the police, who killed the armed man. Another hostage also died on the scene, but of a heart attack on the way to hospital after being shot. Tori Johnson never went home that day, he died in hospital. He never again got to tell his partner of 14 years, Thomas Zinn, that he loved him, or that he wanted him to pick up his socks or any of the things one says to another who is the love of their life, with whom they share heart and home. Mark Bingham was a gay man on United Airlines Flight 93 on September 11, 2001. The plane was in the hands of hijackers. He was rushing home to San Francisco to be an usher at a friend’s wedding. Hijackers took the plane and Bingham and other passengers were herded to the back of the plane. He called his mother and left a message telling her what was happening. Other passengers also called home and learned of the attack on the Twin Towers. Bingham and other passengers decided to rush the cockpit and take the plane back. They fought the hijackers who lost control of the plane, crashing into an empty field instead heavily populated Washington, DC. Father Mychal Judge was a priest and the chaplain to the New York Fire Department. When he learned of the attacks in New York he rushed to the Twin Towers and began offering last rites to those who died. He entered the Towers and began helping those who needed it. As the South Tower collapsed debris flew through the windows and he was killed. Besides their sexual orientation, what Tori Johnson, Oliver Sipple, Mark Bingham and Mychal Judge had in common is that they were heroes, but not by design. Fundamentally they were good men thrust into horrific circumstances who acted in a way consistent with their own moral character. Heroes are good people facing unusual circumstances and remaining true to character. Yesterday we learned that Tori Johnson was a good man. Australian Prime Minister Tony Abbott called Tori Johnson, and the other victim “good people.” Yes, Tori was good people, but to Abbott he still wasn’t good enough, at least not when it came to marriage. Tori and his partner of 14 years, Thomas, could never be married, not in Australia. 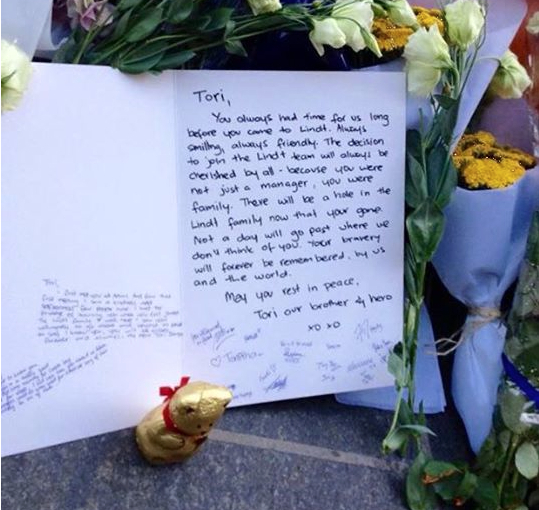 Tori and Thomas deserved the same rights as other Australians. But that right was denied them, and now, for Tori, it’s too late. Prime Minister Tony Abbott laid flowers and said nice words but he’s still fighting to deny marriage rights to “good people” such as Tori Johnson. If Abbot wishes to honor the heroism of Tori Johnson he should push for marriage equality. At the very least, he should get of the way and allow his own party caucus freedom to vote their conscience. For all couples like Tori and Thomas it’s time to pass Senator David Leyonhjelm’s marriage legislation. UPDATE: Thomas Zinn was interviewed on Australian television and said he and Tori were planning to spend their lives together and that they did want to marry as soon as they had the legal right to do so.